Major John Newman has crafted a groundbreaking work that finally illuminates the dark places where democracy goes to die. 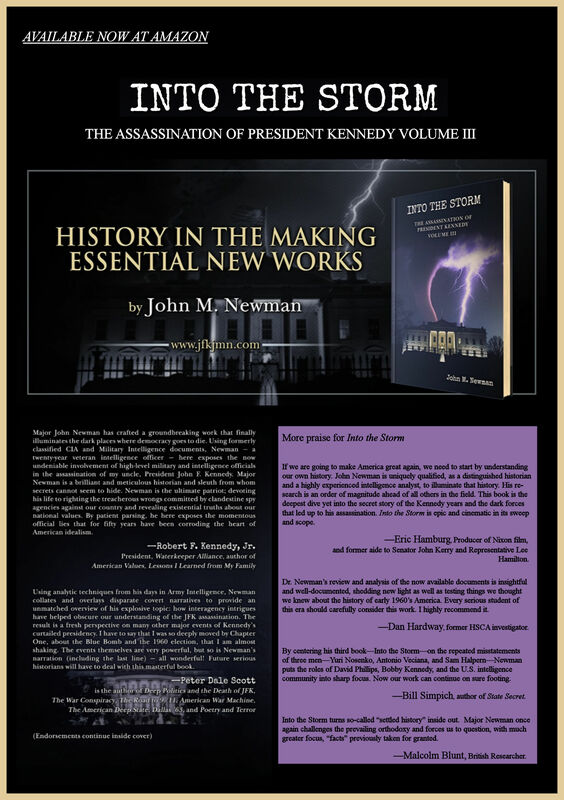 Using formerly classified CIA and Military Intelligence documents, Newman — a twenty-year veteran intelligence officer — here exposes the now undeniable involvement of high-level military and intelligence officials in the assassination of my uncle, President John F. Kennedy. Major Newman is a brilliant and meticulous historian and sleuth from whom secrets cannot seem to hide. Newman is the ultimate patriot; devoting his life to righting the treacherous wrongs committed by clandestine spy agencies against our country and revealing existential truths about our national values. By patient parsing, he here exposes the momentous official lies that for fifty years have been corroding the heart of American idealism. —Robert F. Kennedy, Jr., President, Waterkeeper Alliance, author of American Values, Lessons I Learned from My Family. 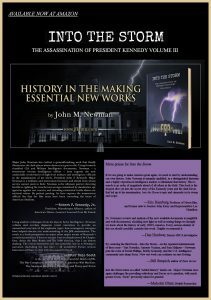 Using analytic techniques from his days in Army Intelligence, Newman collates and overlays disparate covert narratives to provide an unmatched overview of his explosive topic: how interagency intrigues have helped obscure our understanding of the JFK assassination. The result is a fresh perspective on many other major events of Kennedy’s curtailed presidency. I have to say that I was so deeply moved by Chapter One, about the Blue Bomb and the 1960 election, that I am almost shaking. The events themselves are very powerful, but so is Newman’s narration (including the last line) — all wonderful! Future serious historians will have to deal with this masterful book. —Peter Dale Scott is the author of Deep Politics and the Death of JFK, The War Conspiracy, The Road to 9/11, American War Machine, The American Deep State. Dallas ’63, and Poetry and Terror.